There is an encouraging series of posts over on the YouthBlog about Youth Ministers offices. This is encouraging as my office can often get messy and out of hand. Thankfully I have recently cleaned and sorted it out so it is a picture of clutter free productivity at the moment! This will probably not last! 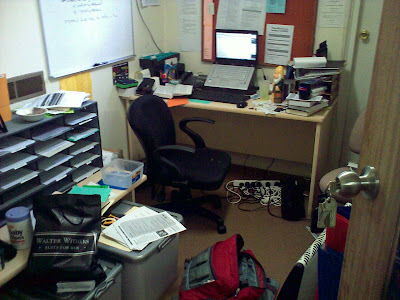 Unfortunately, often my office gets the the state where I just need to spend half a day sorting and clearing things. Here is a photo from about a month or two ago. I'm still hopeful that one day I will be such a GTD pro that I will never let things get like this again... a man can hope I guess! I spent an hour picking up around my office the other day and it still looks just as cluttered, only now the heaps of papers are organized.